Whilst spending my Sunday morning fueling up on coffee and bacon, and making plans for an entire week of being on the road for my day job, I got another text from the parents to let me know that they saw the Axis herd I mentioned earlier this week again. And it’s times like these that I’m glad I have a support community in TTAG to share in my angst about how far hunting season is from today. I’ve got the itch to hit the great outdoors way worse than I have in previous years. Maybe its because I’ve been doing a bit more camping this year, or because my day job has had me way more stressed than last year, I’m not sure. Either way, I’m planning to spend a lot more time in the great outdoors this fall and winter, gun in hand, harvesting some wild game. As part of that, I’ve decided to get outside my comfort zone, the family ranch, a bit. Which is why you see the screenshot above from my recently completed transaction with the State of Texas. I’ve decided to finally take advantage of the Drawn Hunt Program. The program allows a very small amount of lucky hunters access to some truly premiere land for hunting that isn’t available to the common man. In my case, I’ve signed up for three hunting opportunities. 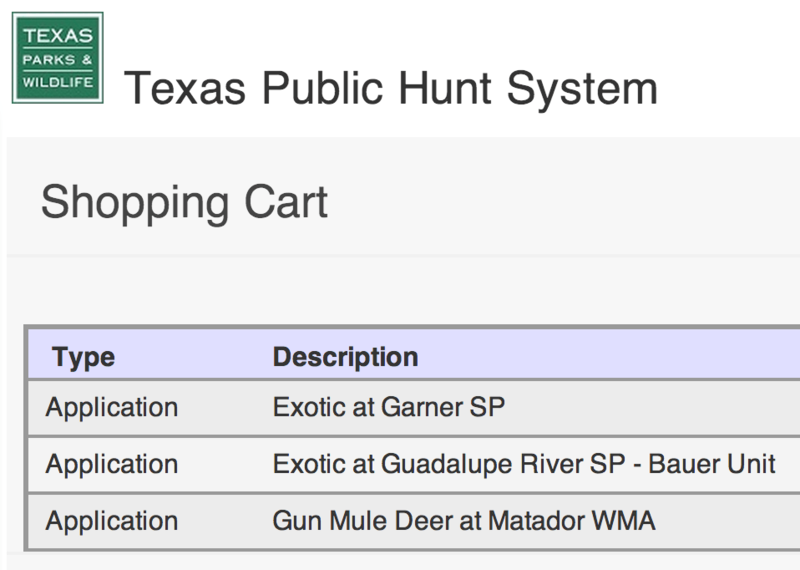 The first is an exotic hunt at Garner State Park for Axis and feral hog. The second is at Guadalupe River State Park for any kind of exotics and feral hogs. The last is a Mule Deer hunt at Matador Wildlife Management Area. The Matador hunt also includes feral hogs. As these hunts are used by the state to manage population and collect data, unlimited hog shooting is included with most of the hunts. Here are some stats on the 2013 success rates and the 2014 costs. As I understand it, and I’m a complete noob at it, TPWD will contact me in the event I win the lottery. Assuming that happens, I’ll pay the state, and hunt during my assigned times either from a blind they’ve set up or all on my lonesome in an assigned area. In the event that I don’t win, I’ll get a loyalty point towards next year’s lottery which will get me more tickets in the lottery. I don’t know if this process has made me any less anxious about the upcoming hunting season, but it has made me feel like I’m doing “something” vs. sitting on the couch looking at hunting forecasts, and guns, and ammo. Now off to go research dove hunting strategies I guess. I love it when the state works in harmony with the locals to solve a problem. Far too often I read perplexing stories of municipalities who hire “professional” hunters to eliminate nuisance game when they could simply generate revenue with their own citizens. Is the author British? Are “fitments” and “bags of kit” coming up next? Good stuff Tyler. Keep it coming. None of my draw-tags were successful. Utah muley, Montana moose. If I get that Muley hunt, I’ll lose it. I’ve been reading up on that WMA and it looks like a great spot.